Marcello Truzzi was one of the founding co-chairmen of the Committee for the Scientific Investigation of Claims of the Paranormal and editor of their journal “The Zetetic”, but was voted out because he wanted to include pro-paranormal people in the organization and pro-paranormal research in the journal, but CSICOP felt that there were already enough organizations and journals dedicated to the paranormal. 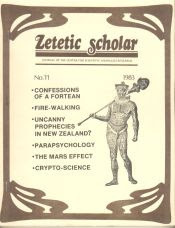 Kendrick Frazier, instead, became the editor of CSICOP’s journal and the name was changed to “the Skeptical Inquirer”. -The tendency to deny, rather than doubt. -Double standards in the application of criticism. -The making of judgements without full inquiry. -Tendency to discredit, rather than investigate. -Use of ridicule or ad hominem attacks. -Presenting insufficient evidence or proof. -Assuming criticism requires no burden of proof. -Counter-claims based on plausibility rather than empirical evidence. -Suggesting that unconvincing evidence is grounds for dismissing it. -Tendency to dismiss all evidence.